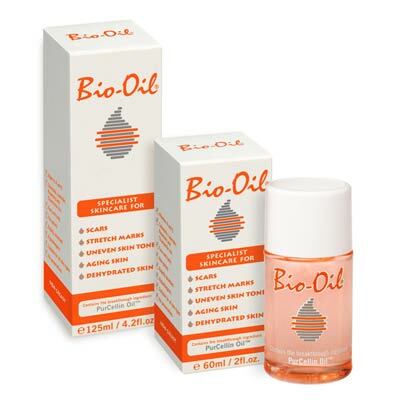 Long used as a topical stretch mark remedy, Bio-Oil is a do-it-all skin saver that contains a non-clogging, natural blend of calendula, lavender, and rosemary oils as well as chamomile extract and vitamins A and E. It does everything from help fade dark spots and acne scars to moisturize all over. Here, my top 10 favorite uses. 1. Add a tiny bit to your foundation (mix the combo on the back of your hand) for a more natural look. It sheers out the formula so it blends seamlessly into skin. 2. Spike your bath water with a few drops to condition skin. Spa-tastic! 3. Mix a drop with bronzer for a dewy glow. Do the same with eye shadow for a creamy finish. 4. Slather it on as a pre shave treatment to soften skin and prevent nicks. 5. Smooth on freshly plucked brows to soothe skin and reduce redness. 6. Scratchy scalp? Add it to your shampoo to reduce itching and flaking. 7. Massage it onto skin to moisturize dry spots like cracked elbows and heels. It works on chapped lips and shaggy cuticles too! 8. Rub it on sunburns to prevent peeling and sooth burned skin. 9. Finger-comb it into hair to tame pesky fly-aways and hydrate dry ends. 10. Smooth it on all over before showering to seal in a spray tan.